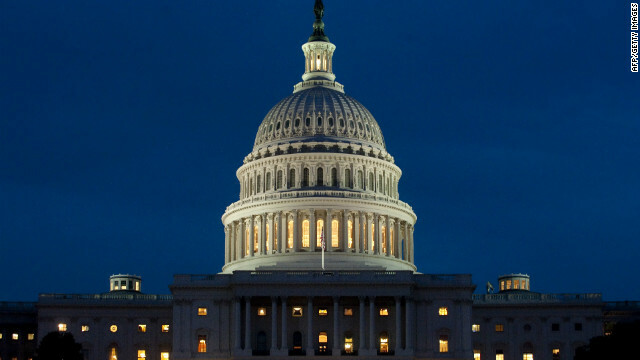 The latest effort by Congress to save your pension may be putting it further at risk. Tucked away in last week's bipartisan budget deal was a provision to sharply raise the premiums on a government-run fund to backstop private pension funds that go bust. 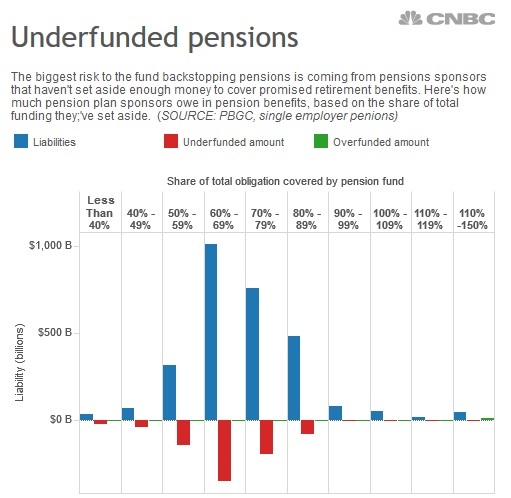 With the fund falling deeper in the red, the higher premiums charged to companies offering traditional defined benefit pensions are intended to help put the Pension Benefit Guaranty Corp. back on a solid financial footing. But critics say the higher premiums — set to rise from $57 per covered worker this year to $78 in 2019 — could prompt even more companies to freeze or close out their traditional defined benefit pensions that pay retirees a guaranteed monthly check for life. "The premium increase is just another unnecessary burden on employers who sponsor defined benefit plans, giving them more reasons to consider exit strategies," said Annette Guarisco Fildes, president of the ERISA Industry Committee, which advocates for large companies that offer pensions. 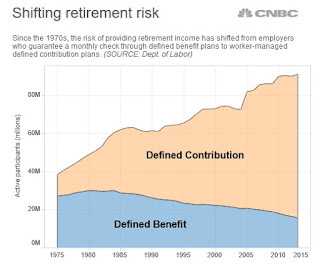 Long before premiums began rising, companies that offer defined benefit pensions plans had been moving to freeze them (fixing participants' retirement benefits no matter how much longer they work) or closing them to new workers. A survey released earlier this year by benefits consultant Aon Hewitt of nearly 250 employers representing 6 million employees found that, of the roughly three-quarters who still offer a defined benefit plan, a third were closing them and another third had frozen them. The trend continues a decade-long decline in defined benefit plans in favor of defined contribution plans like 401(k) retirement plans. That historic shift has been cited by some retirement researchers as a major reason for the deficit in retirement savings estimated by the Employee Benefits Research Institute at more than $4 trillion for U.S. households in which the breadwinner is between ages 25 and 64. Companies that still offer their workers defined pension benefits are facing their own funding shortfall, with too little money set aside in pension assets to cover the cost of paying current and future retiree benefits. Both public and private pension funds were hit hard by the 2008 financial crisis, which wiped out trillions of dollars in investments that were used to pay retiree benefits. Since then, low interest rates have cut returns and increased the amount of money needed to generate enough income to write monthly checks to retirees. Underfunded pensions, of course, represent the biggest potential liability for the Pension Benefit Guaranty Corp., which steps in when a pension fund can no longer cover what it owes its participants. Many of the biggest shortfalls have hit older companies with declining profits and large pools of older workers and retirees. 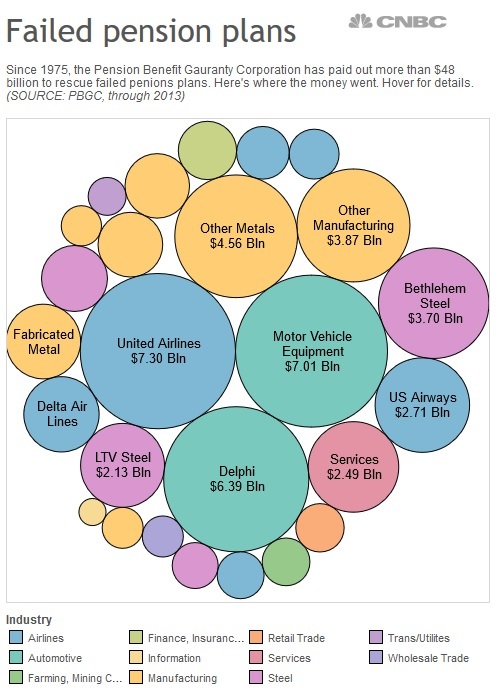 Of the 10 biggest pension takeovers by the agency in the last four decades, five were plans offered by airlines and four were pension plans for steel companies. 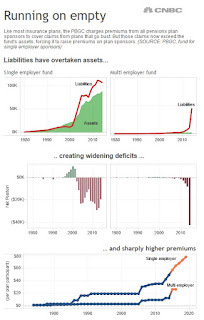 Since 2000, the cost of backstopping failed pension plans has overtaken the money set aside to cover that cost, leaving the corporation with a deficit of more than $60 billion. Without the higher premiums, agency officials say, the fund will run eventually out of money. Estimating when that might happen is not easy, especially given the move by pension plan sponsors to reduce their liabilities by closing or freezing plans. A lot also depends on how quickly companies move to shore up pensions that are underfunded. Since the Great Recession ended, and the economy and stock market have recovered, many private plans have gained ground and raised funding levels. But they still face a multi-billion-dollar gap. 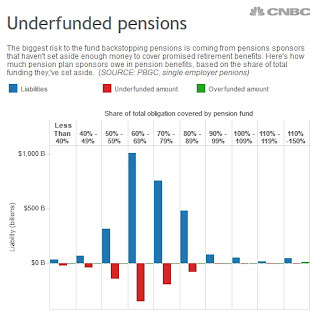 The defined benefit plans offered by 100 large companies tracked by benefits consultant Milliman face a $366 billion pension funding shortfall, based on the latest data available. On average, they've set aside less than 82 cents for every dollar in obligations to current and future retirees. The recently enacted budget also includes a higher tax penalty for underfunded pensions, starting in 2017. Those single employer sponsors, who manage pension assets for workers of only one company, are in much better shape than so-called multi-employer plans, which cover workers from more than company. About a quarter of the roughly 40 million workers who participate in a traditional defined benefit plan are covered by these multi-employer plans, according to the Bureau of Labor Statistics. Those plans, which typically cover smaller companies and unions, face an even tougher set of financial challenges than larger plans that can spread risk over a bigger pool of workers. Declining union enrollments, for example, mean there are fewer active workers to cover the cost of paying retirees, many of whom are living longer than was expected when these plans were established. Multi-employer plans also face an added burden of their shared pension liabilities. When one company in the plan fails to keep up with contributions, for example, the burden on the other members increases. In the last four years, the Department of Labor has notified workers in more than 675 of these plans that their plans are in "critical or endangered status." I recently covered Teamsters' pension fund, stating multi-employer plans are withering away and it's all part of a much bigger problem. 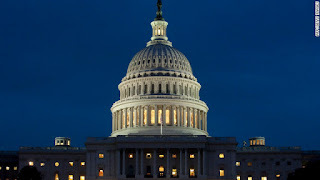 The article above is excellent and provides a great overview of what's wrong with Congress's latest pension fix and why so many American defined-benefit plans are closing or on the verge of closing. First, as I discussed in the quiet Screwing of America, the latest effort by Congress to "fix" pensions will backfire spectacularly and pretty much ensure more pension poverty in the world's most powerful nation. When it comes to pensions, there is no justice in America. Second, companies are increasingly shifting retirement risk onto employees by closing DB plans and shifting new or existing employees to DC plans, or looking to offload pension obligations to some insurance company which will gladly de-risk a DB plan for a nice fee and then offer annuities to employees. [...] the knee-jerk move by many plan sponsors to offload their pension risks may be a little hasty. While there may be a natural inclination to want to rid themselves of their pension obligations as soon as financially possible, now may not necessarily be the best time to do it. Mark Firman, a pension lawyer with McCarthy Tetrault, notes that by buying up annuities, some firms may be trading in one type of risk for two others — what he refers to as reputation risk and regret risk. The idea, says Mr. Firman, is that companies — particularly those in booming sectors like energy — who purchase annuities as a first step toward winding down their defined-benefit pensions, may find they are harming their image as progressive employers among current and prospective talent, labour bargaining units and socially conscious institutional investors. That’s the reputation risk. For those who prefer cold, hard numbers to less definitive, warm and fuzzy aspects of business management, the regret risk will likely have deeper resonance. Purchasing an annuity today when interest rates are low means getting an insurance company to buy a greater liability and to do so for a higher fee. That higher fee goes toward protecting the insurance company not only from the longevity risk it’s buying but also the likely risk of future interest rate hikes. However, unlike the 1990s, pension legislation (in Canada) now allows plan sponsors greater access to those surpluses, which could be used for myriad business-development initiatives and investments. The good news is there may be a happy medium for plan sponsors who are looking to de-risk in the short term but not necessarily with the intent to wind down their plans entirely or imminently. According to the Towers Watson data, of the $2.2-billion in annuities purchased in 2013, $850-million was made up of what the consulting firm refers to as “buy-in” transactions. While very similar to the more traditional “buy out” annuities, buy-ins vary on a number of important levels, not least of which is a reversal clause that allows plan sponsors to countermand the transaction down the road — for a fee, of course. Towers Watson recently closed a buy-in deal worth approximately $500-million — perhaps the largest single annuity transaction in Canadian history — but the plan sponsor preferred to remain anonymous. A similar, $150-million dollar deal was finalized between Sun Life Financial Inc. and the Canadian Wheat Board last year. David Burke, Canadian retirement leader for Towers Watson, says his practice has been trying to steer pension sponsors away from de-risking and toward what he refers to as “right-risking” — a more sophisticated strategy that takes into account each individual sponsor’s solvency and liability scenarios, their future intentions with respect to the lifespan of the plan and prospective market conditions – to better gauge if, when and how they should limit pension-related risks. His comments are echoed by Mr. Forestell, who believes basic annuity buy-outs will quickly evolve into more complex transactions. “What I expect to see in the next year or year and a half is more creative deals in how to do the annuities,” he says. In the interim, the movement to de-risk is likely to intensify and understandably so given the nail biting that has taken place in recent years. The pity is there will likely be more than a few sponsors stricken with buyer’s remorse a decade from now. Then again, by that point the idea of a defined-benefit pension may very well be an abstract and quasi-historical concept in the private sector. Of course, insurance companies will tell you now is the right time to de-risk your DB plan and companies struggling with their pension costs are doing the rational thing by offloading future pension obligations onto them. The problem here isn't with companies, which are acting very rationally, it's with the national retirement policy. In my opinion, pensions should be mandatory and managed by well governed public pension funds and backed by the full faith and credit of the federal government. We should also introduce the shared-risk model to make sure these public pensions remain solvent no matter what economic environment awaits them in the future. This is why I've long argued for enhancing the Canada Pension Plan to introduce real change to Canada's retirement system and argued the United States needs to enhance Social Security for millions of Americans that are falling through the cracks. Of course, to do this properly, the U.S. needs to adopt and improve on Canada's pension governance and get independent, qualified investment boards to supervise its sprawling public pensions. Remember, my view is that there is no end to the deflation supercycle and that deflation will decimate all pensions, especially corporate plans that are not chasing a rate-of-return fantasy and are using market rates (not rosy investment assumptions) to discount their future liabilities. This is why now is the time to introduce real change to the retirement policies of advanced nations and treat pensions like we treat health care and education. In my opinion, a vibrant democracy has three pillars: solid public health care, education and pensions. All three contribute to the economy in important ways but faced critics only focus on the costs, not the benefits of defined-benefit plans. It's important to educate people on the the huge advantages of well-governed defined-benefit (DB) plans. These include pooling investment risk, longevity risk, and significantly lowering costs by bringing public and private investments and absolute return strategies internally to be managed by well compensated pension fund managers who are also able to invest with the very best external managers as they see fit, making sure alignment of interests are there. DB plans also offer huge benefits to the overall economy, ones that will bolster the economy in tough times and reduce long-term debt. In short, there shouldn't be four, five or more views on DB vs DC plans. The sooner policymakers accept the brutal truth on DC plans, the better off hard working people and the better off advanced economies struggling with global deflation will be. The success of the early post-war public and private pensions were the result of them being aligned with the political environment of the time. There is little political consensus on many important contemporary issues, and so pensions represent just another area of policy incoherence. This incoherence means that it is unclear what reforms would be seen as successful. I hope to discuss such reforms in later articles. I agree with Brian, there's way too much policy incoherence on pensions and other important economic topics. In my view, any paradigm shift in macroeconomics has to incorporate a coherent view which convincingly argues for bolstering well-governed public defined-benefit pensions recognizing the long-term benefits this will have on growth and reducing debt. Below, former media executive Mel Karmazin said Wednesday he's no longer invested in the stock market, and that he's basically in cash. Karmazin also discussed the buyback bubble which is the real bubble the Fed is fueling. The Fed doesn't care about about Republicans or Democrats, only about big banks and their elite hedge fund and private equity clients. Interestingly, while the Fed needed to lower rates and engage in QE to prevent another Great Depression, ZIRP and QE ended up exacerbating inequality via several channels. First, companies were incentivized to borrow big and repurchase shares to pad the bloated compensation of their top brass. Second, U.S. public pensions were forced to take on more risk investing in hedge funds and private equity funds to make their 8% pension rate-of-return fantasy. Lastly, historical low rates punish savers and reward financial speculators as people who need to rely on a fixed income can't invest in fixed income assets that yield enough. This is why I've long argued that U.S. Social Security needs to move the way the Canada Pension Plan has moved which has assets managed by the Canada Pension Plan Investment Board, a national pension fund which directly invests in public and private markets and is supervised by a qualified, independent investment board. But first you need to get the governance right and unfortunately, the U.S. will never get the governance right because there are too many powerful interests milking public pension funds dry. All this to say, there is a conspiracy which is going on at the Fed but it has nothing to do with what the Republicans or Democrats are claiming. Also, at one point on Wednesday morning on CNBC, Karmazin discussed how he agonized cutting defined-benefit plans for employees under 55 years old, knowing full well that it penalized employees but he needed to do it to save one of the companies he was managing. The truth is if America went Dutch on pensions, CEOs wouldn't have to agonize over such decisions and employees can have peace of mind that even if their company went under, they'll be able to retire in dignity and security. In fact, going Dutch/ Canadian on pensions is the only pension fix that won't backfire and pay off in the very long-run.